My So- Called Handmade Life: Where's my Stuff? Remember Melanie Hutsell's "Where's my stuff!?" bit on SNL? I don't blame you if you skipped it, it was kind of long (the best part is at 4:12), but it takes me back to my first election to ever participate in, so I indulged. Oh yeah, and I got stuff! I never win stuff. Actually, I never try to win stuff, but this last month I did and won four times. (One was for participation, but three were just for stalking blogs and commenting.) It so pays to lurk. Let me tell you about one of my prizes. 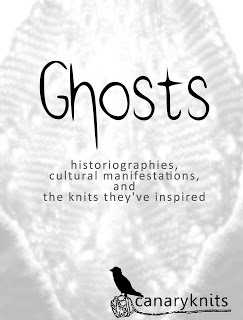 I won a copy of Teresa Gregorio's ebook Ghosts on Kathleen Dames' website. It was the day after Halloween when I received it and found it would be a good read even without the patterns. But the patterns are great. There's just a lot I didn't know about the subject of ghosts. This sent me on some internet chases about Houdini's Margery Box and some of the earliest photos of "ghosts" or ectoplasm as Teresa covers the development of ghost lore in Western culture. The way the lore changed due to the perceived audience and available technology to prove (or stage) it's existence had never occurred to me. As a Protestant Christian who doesn't believe in free roaming ghosts of the dead, I found it interesting that she notes the similarity between Hebrew doctrine and that of the Protestant reformation concerning ghosts, namely the fact that they don't really mention them. (There is a very interesting quote by King James I here.) She suggests it was from the same doctrinal motivation to encourage monotheism. Since Protestant beliefs were based upon that of the Hebrews, I think it was the same; but personally, I think the mention they do make of the spirits inside of each person made for eternity, of the Holy Spirit, and of angelic beings could pretty much explain any ghost sitings. It also brought Jude 1:6 to my mind, where the proper domain of angelic beings is mentioned and how it had been breached. Of course, I still don't get that thing about Samuel... but anyway, she got me thinking. The way the rest of the world views a spirit's domain is something I know little about. I only know that, globally, there are lots of similarities in ancient texts about creation, cataclysm, judgement, and messiah types. So, Teresa's overview of the purpose or cause for their belief in roaming spirits was new to me. Bhuts are the creepiest of all, but the fact that they inspired the sock pattern in the book cracks me up. Now, as for the patterns, they are all very unique and wearable, I can't decide which are my favorites. I'm thinking it is probably the Athenodorus skirt and the Calavera Catrina bonnet. That skirt is so cool with it's changing yarn weights. I wonder if I can get it knit by spring? Thank you, Kathleen, for hosting the drawing and Canary Sanctuary for giving the ebook. I will never, ever have to ask "Where's my stuff?!" again.